EBL: Elizabeth Warren found her Cherokee Connection! 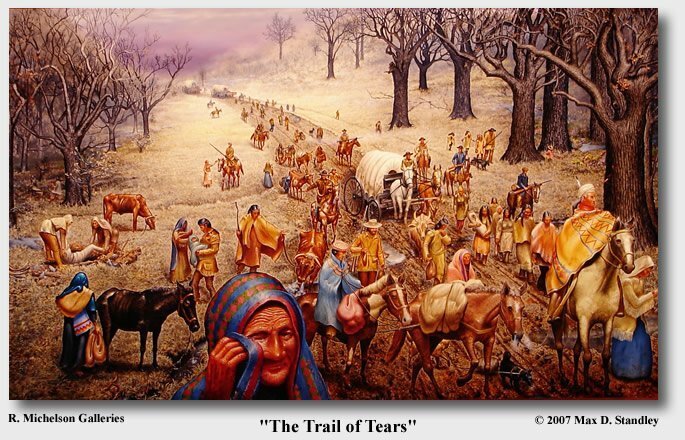 One of her relatives helped round up the Cherokee in Tennessee to send them on the Trail of Tears to Oklahoma! Elizabeth Warren found her Cherokee Connection! One of her relatives helped round up the Cherokee in Tennessee to send them on the Trail of Tears to Oklahoma! "[Elizabeth Warren] found her Indian blood...not in her veins, but on her hands." Professor Jacobson: This is an example of "Stolen Cherokee Valor..." Legal Insurrection is doing the hard leg work and genealogy in running this story to the ground. Scott Brown calls for Elizabeth Warren to release past applications where she may have claimed Native American ancestry. Best comment on this kerfuffle ....."she found her Indian blood...not in her veins, but on her hands." Yes, that is a great comment! Thanks.